On Wednesday 3 at 6.30 pm, Bophana Center presents Ratanakiri, an exhibition of photographs by Cédric Delannoy, who spent three years in the province working on the Annâdya project, a European Union funded effort to improve food security for ethnic minorities in far north eastern Cambodia. Cédric will introduce a documentary on the project at 6.30 pm, with cocktail reception to follow. Coming up on Wednesdays in June, commencing Wednesday 3 at 6.15 pm, Phnom Penh Community College presents a series of workshops entitled Fundamentals of Drawing under direction of France Damon. Bookings essential. 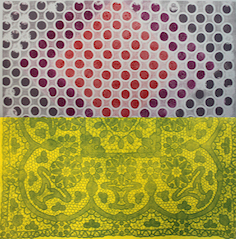 At Meta House on Thursday 4 at 6pm, the opening of a retrospective of work by textile and print artist Marine Ky, Optical Screens and The Earth, curated by Dana Langlois. Runs until 28th June. As part of the exhibition, on Saturday 6 at 4 pm Marine will hold an artists’ talk, Crafting the Sublime to discuss craft, beauty and transforming the everyday into art. Down in Kampot on Saturday 6 at 8 pm, Ecran Moviehouse presents An Evening With Scott Bywater, a special show combining songs, spoken word poetry and visuals. The show will contain material from the WASH collaboration as well as newer work. Scott is also performing a more straightforward rock’n’roll show full of original compositions at Madi’s House, Kampot, on Friday 5. Wednesday 3 at 6.30 pm, Bophana Center presents Ratanakiri, an exhibition of photographs by Cédric Delannoy. Cédric will introduce a documentary, Annâdya, at 6.30 pm, with cocktail reception to follow. Commencing Wednesday 3 at 6.15 pm, Phnom Penh Community College presents a series of workshops entitled Fundamentals of Drawing under direction of France Damon. Bookings essential. Thursday 4 at 6 pm at Meta House, the opening of a retrospective of work by textile and print artist Marine Ky, Optical Screens and The Earth, curated by Dana Langlois. Runs until 28th June. Saturday 6 at 4 pm at Meta House, Marine Ky will hold an artists’ talk, Crafting the Sublime to discuss craft, beauty and transforming the everyday into art. Saturday 6 at 8 pm, Ecran Moviehouse in Kampot presents An Evening With Scott Bywater, a special show combining songs, spoken word poetry and visuals. At MetaHouse, a poster exhibition Creativity In The Cities that depicts creative spaces in east and south east Asia and Europe. At the French Institute, images of World War One from French cartoonist Jacques Tardi’s book Putain de guerre, including works produced in 2014 by students of the Lycée français René Descartes.